Education Minister Naphtali Bennett learned something new when he expressed surprise at the extent of displacement and persecution Jews from Arab countries had suffered. He was taking part in the first session of the Biton committee convened last week. The Committee was set up to advise how the history and culture of Jews from Arab countries might be introduced into the Israeli school curriculum. 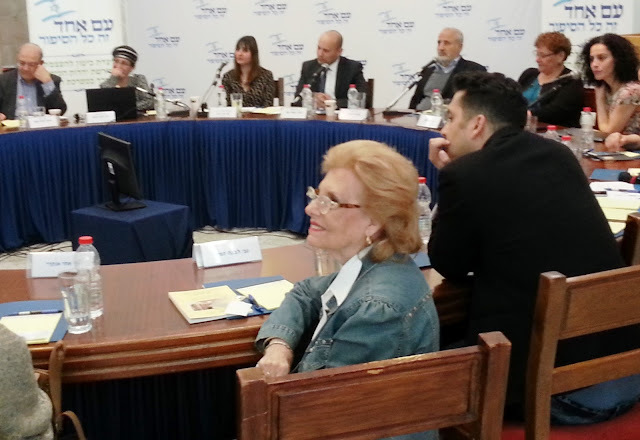 The photo shows Levana Zamir in the foreground at the opening session, with (L-R): Prof. Maman, Zahava Shemesh (coordinator) Michal Cohen, Director General of Ministry of Education, Minister Naftali Bennett and Erez Biton. During the opening session of the Biton committee, titled :"One People: that is what it is all about" (Am Ehad: zeh kol ha sipur ) most of the topics centered around literature, poetry and heritage. However, Mrs Levana Zamir, chairman of the Israeli umbrella organsiation representing Jews from Arab and Muslim countries, said: " it is important of course to renew books on culture, poetry, Zionism and the Golden Age of Jews in Arab countries, but it is equally important to introduce in the new textbooks the "tragedy" of Jews from Arab countries, the expulsions, persecutions, the forced departure, the escapes, the loss of properties and identity, etc." Minister Bennett answered: "I did not know it was such a mass expulsion and that there was such persecution in Egypt and other Arab countries." The Minister noted in his working paper that all this will be clearly included in the new programs. The committee, chaired by the Algerian-born poet Erez Biton, is aiming to submit within three months to the Minister of Education a program on how to implement the history and culture of Jews from Arab countries in the educational system. The Biton Comittee is a public committee of seven members, which will provide advice on various issues and brainstorm new ideas. Erez Biton - head of the committee, will expand the Israeli TV series 'Amoud Ha'esh' (Pillar of Fire).' These 19 TV chapters on the rebirth and creation of the State of Israel from 1896 to May 1948 did not include a single chapter about the heritage, role and tragedy of the Jews from Arab countries. Biton will introduce new chapters on the Jews of Arab lands, and will initiate new TV productions to expose their cultural, spiritual, and historical richness. Professor Aharon Maman is responsible for History. Dr. Yehuda Mimran heads the Philosophy Committee, Dr. Alfasi the Literature Committee, Dina Drory poetry, Prof. Moshe Amar heads the Academic and Research committee. Ms. Zehava Shemesh is the coordinator of the whole Biton Committee. It is scandalous that an Israeli Minister of Education can say "I did not know" about the crimes committed against Mizrahi Jews by Arab League states. He is not fit for the job. I am left speechless and a little disgusted that Bennett can be so ignorant. If an Israeli can say this, No wonder then that young Jews on American campuses who are even more ignorant flock to join anti Israel groups and participate in the most virulently racist events like so called apartheid week. What does it take for Israel to wake up? I was sad to see the lack of visibility of Jews of Arab lands in Israeli culture 40 years ago after the YK war...it was a little better in 2009 my last visit. still not good enough.